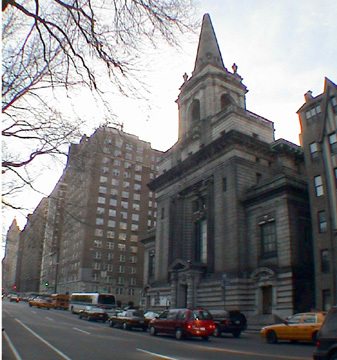 The First Church of Christ, Scientist, on the northwest corner of Central Park West and 96th Street is a monumental edifice of very imposing grandeur. Designed by Carrère & Hastings, it was completed in 1904. The Christian Science Church was founded in Boston by Mary Baker Eddy after the Civil War and emphasized healing through faith. Mrs. Eddy appointed Augusta Stetson in the 1880s to establish a branch in New York City. In his superb book, "New York Streetscapes: Tales of Significant Buildings and Landmarks," (Harry N. Abrams, Inc., 2003), Christopher Gray observes that Mrs. Stetson apparently was quite "contentious." 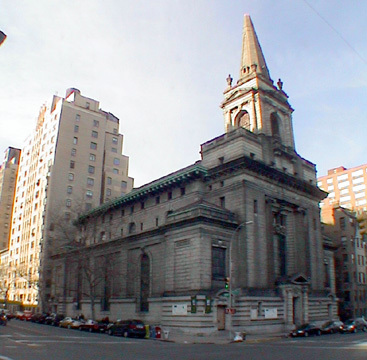 "When the Second Church of Christ, Scientist bought a building site at 68th Street and Central Park West in 1898, she tried to interfere with their purchase, and then purchased one two blocks south, to try to scare them away from what she thought was First Church's neighborhood. When Mrs. Eddy died in 1910 she left a bequest to Second Church, but not Mrs. Stetson's organization. In 1909, while still head for First Church, Mrs. Stetson was excommunicated from the Mother Church in Boston and then left First Church. 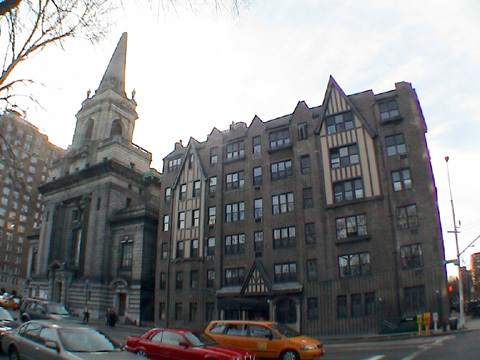 However, she remained in her house next door at 5 West 96th Street, successfully suing First Church in 1923 to prevent it from erecting a wall that would cut off her east light. She died in 1928."